With an ASE-certified master mechanic on staff, we get all sorts of questions about gas and diesel engine problems. Some of them are pretty general and hard to diagnose through a quick conversation. Not that we aim to be able to do that for everyone, but it's nice when we're able to shed some light on a problem that makes another person feel more confident in being able to go out and make the right decisions in solving their problems. "Black smoke" is one of those general symptoms that seems to indicate a problem, but which bears further investigation to figure out what the cause is. Really, any smoke would fall into this category. Because you've not just got black smoke, there's also white diesel smoke and even blue diesel smoke. 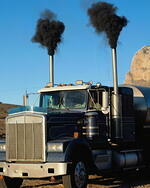 So let's do a quick rundown of what to suspect what you've got diesel smoke where it shouldn't be. White Smoke - white smoke means that the fuel that is being injected into the combustion chamber is not being burned properly. The common causes that produce white smoke range from something as simple as low engine compression or water in the fuel to the fuel pump timing being thrown off because something is starving the fuel from getting to the pump in the manner necessary for the pump to time and work correctly. Blue Smoke - blue smoke results from burning engine oil. This is a mechanical problem because engine oil isn't supposed to be getting into areas where it can be burned. There could be a faulty injector pump or lift pump, which would allow oil to mix with fuel and be burned. The valves or valve stem seals could be bad. Worn cylinders and piston rings (X-tra Lube can help with this problem) allows oil to seep where it shouldn't. Or you could have a problem as simple as having put too much oil in the engine. This post was published on June 20, 2013 and was updated on September 26, 2017.